I got on the bandwagon and pre-ordered this one very early. I was really disappointed that it keep getting delayed but I can tell you that it was well worth the wait. I love everything about this deck. The packaging is divine. I feel that more artists are coming up with beautiful ways to package their decks and there is a movement away from the flip box. Those always seem so flimsy to me. I don’t store mine in their original boxes. 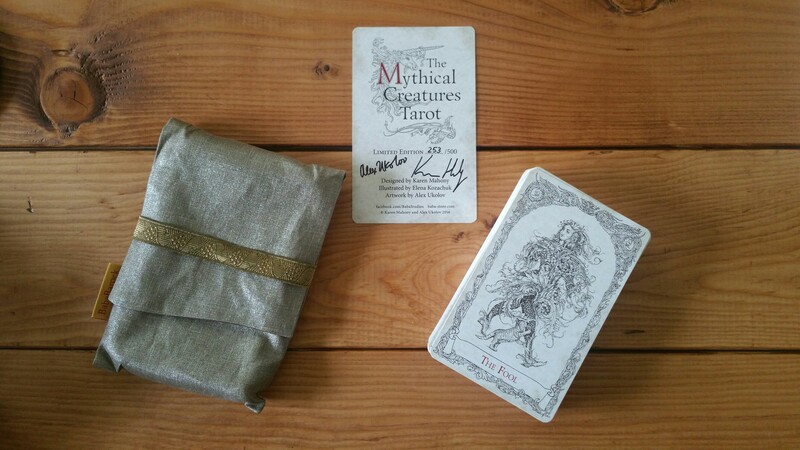 I immediately take the deck and store it in a velvet pouch I find this prevents wear. I keep the boxes up on my bookshelf for display purposes. BUT, if you have a lovely box like the one that this deck came in you would want to keep it in it. Not only does it have a lovely box but it comes in a very sturdy and equally beautiful gold pouch. Such care was taken in creating this deck. Every aspect has been wonderfully thought out. I believe it took the creators a long time – I think back to 2005 to develop this deck. I’m actually not very familiar with the Marseille style, certainly not enough to use it for readings. Even so the artistic value alone was enough for me to invest $100.00 into it. For me this will be more of a collectors item. Its currently standing proudly on display on my bookshelf with some other one of a kind decks that I never really remove from their boxes. The cardstock is very sturdy, which I find to be a good thing. I could see with the size of this deck in combination with the sturdy cardstock it may pose a challenge to shuffle. It is larger than your average cards. Think around the size of the Mary-El tarot. 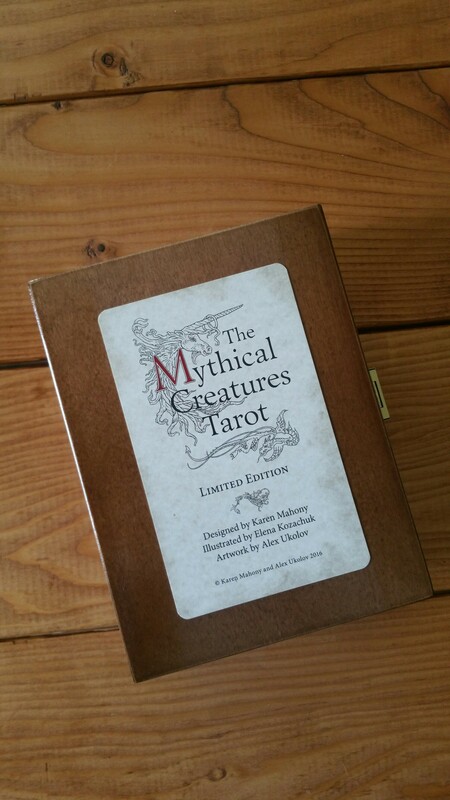 Many of the creatures in the major arcana I was unfamiliar with, luckily the deck comes with a little white book describing each creature and the meaning of each card. The artists care definitely extended to choosing which creature to feature on each card. I love the bronze detail of these cards. The artwork is so delicate and vintage looking. 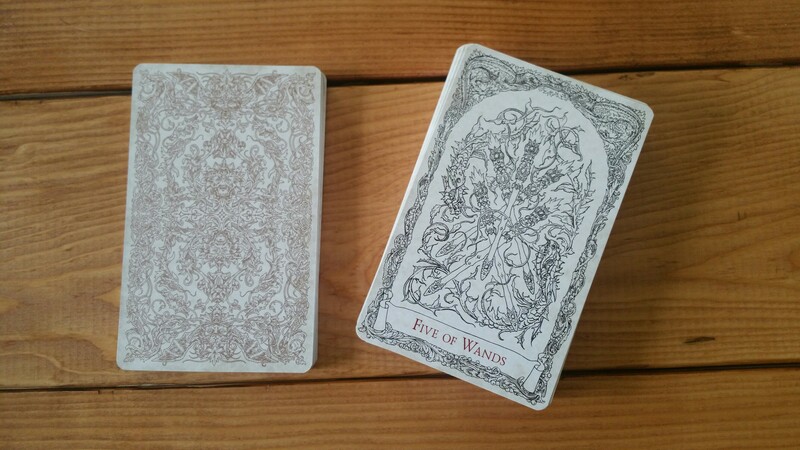 If you can find this deck (I’m not sure if Baba Studios has any of these left in stock) I would encourage you to purchase it if you can afford the price tag. Only 500 copies were made. I hear there are plans to make a colored version of this deck within the next few years. The monochrome deck will never be available again. The deck did come with a colored Fool card. If it is an indication of what the colored version will look like then I’m sure you won’t be disappointed (it is currently sitting on my desk at work as a reminder of the message of the Fool).